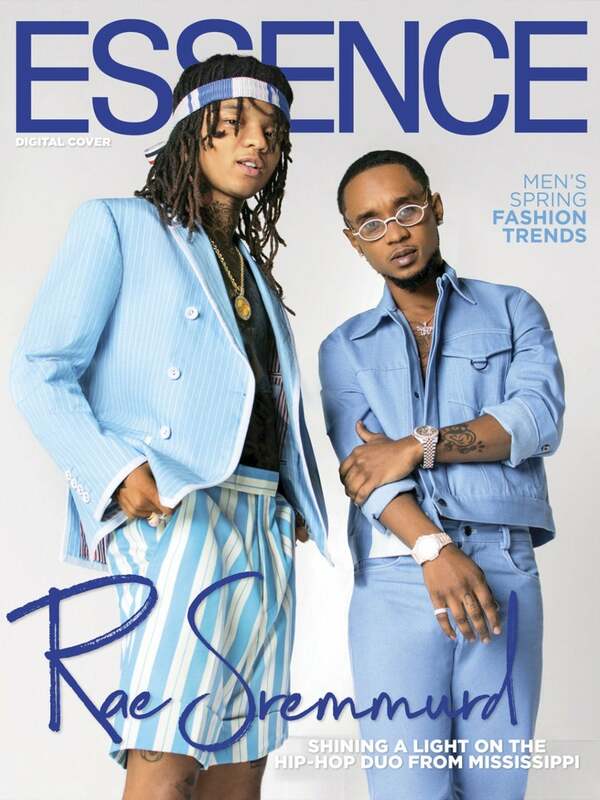 Brothers Aaquil and Khalif Brown (best known as popular rap duo Rae Sremmurd) already had a few hits under their belt when they caught the attention of mainstream music lovers in 2016. Their single, “Black Beatles,” reached No. 1 that year after it became the soundtrack to the Mannequin Challenge. The rest is hip-hop Internet dance craze history. Though the brothers continue to give fans more of the collaborative sound that helped them dominate the airwaves early on in their careers, their pursuits as solo artists have also generated a fair amount of buzz in recent months. 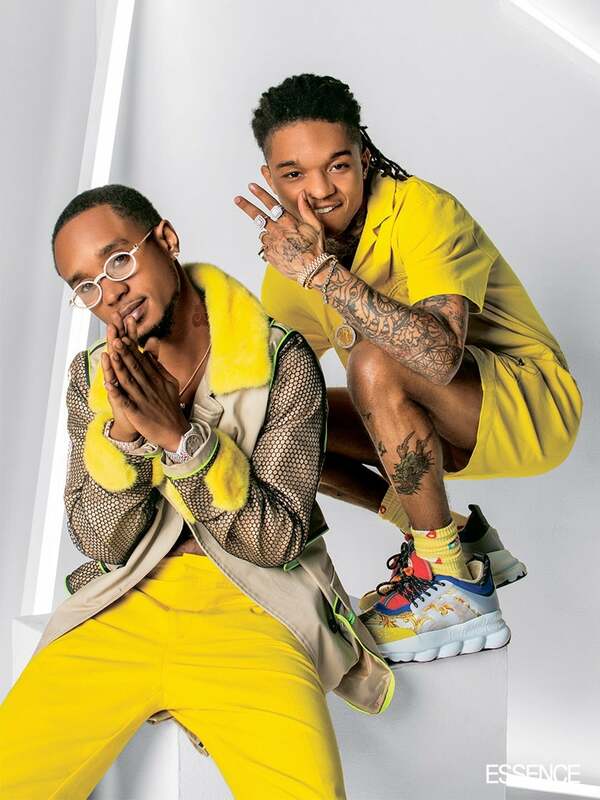 While promoting SR3MM, the duo sent fans into a frenzy when Aaquil (better known as Slim Jxmmi) tweeted that he was not a part of the group with brother Khalif (aka Swae Lee). With a 2019 Grammy nomination for his guest appearance on Travis Scott’s “Sicko Mode” and a standout feature on the Spider-Man: Into the Spider-Verse sound track, Lee responded by stating that he and his brother are still together, but that solo projects are, in fact, in the works. ON SWAE LEE: LAND of distraction “Jay” jacket, $685, and “Mary” pant, $925, landofdistraction.com. The Kooples sneakers, $315, thekooples·com. Jewelry, Swae Lee’s own. 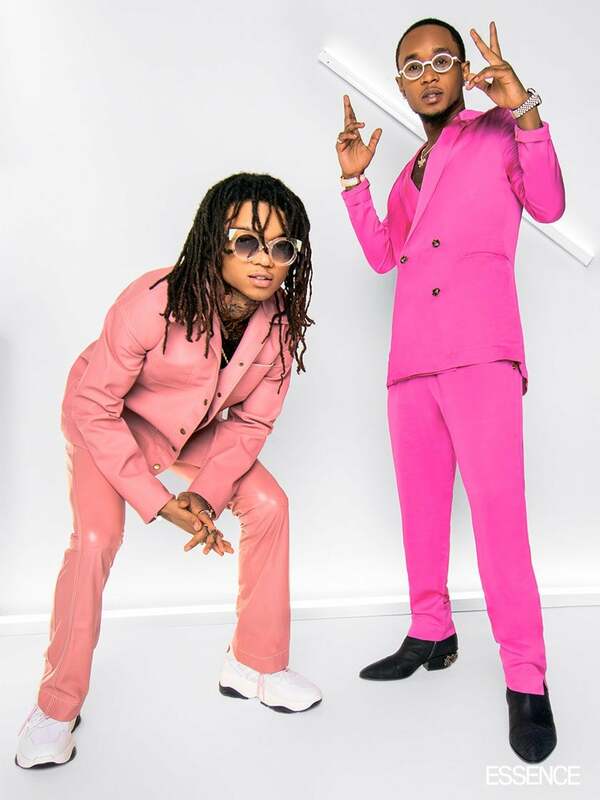 ON SLIM JXMMI: Scotch & Soda “Double Breasted” blazer, $250, and “Tailored Jacquard” trousers, $150, scotch-soda·com. GIUSEPPE ZANOTTI “Kevan Alligator” boot, $1,595, giuseppezanotti·com. Jewelry and glasses, Slim Jxmmi’s own. My take on fashion is to dress in a way that looks good to you. 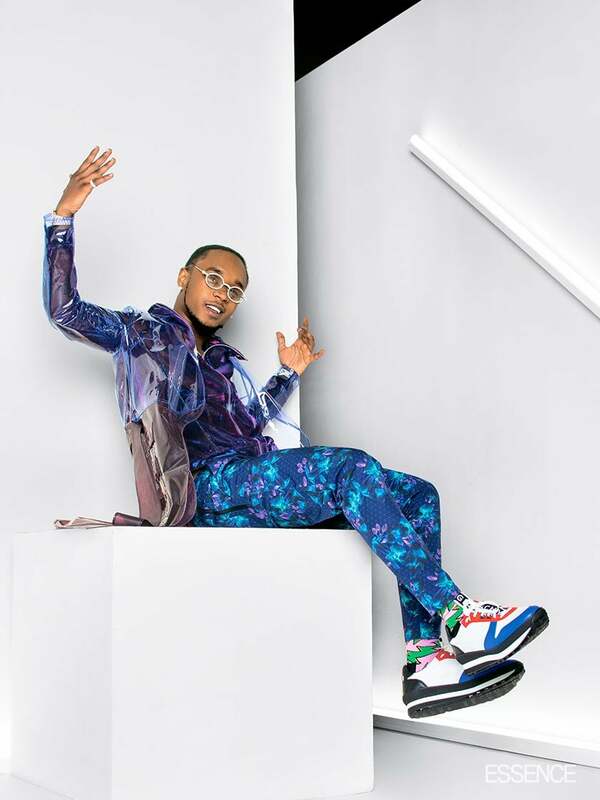 ON SLIM JXMMI: Julianna Bass “Saran” jacket, $995, juliannabass.com. Lucio Castro “The Lucio Zip Up” jacket, priced upon request, luciocastro.com. DYNE “Pisano Woven” pant, $260, dyne.life. Givenchy “TR3 Runner” sneakers, $577, farfetch·com. Jewelry and glasses, Slim Jxmmi’s own. ON SWAE LEE: Libertine “Provence Painting Army Parka” jacket, $4,000, and “Purple Floral Trouser” pant, $1,125, ilovelibertine·com. Moose Knuckles “Logo Sport” slides, $100, mooseknucklescanada.com. Happy Socks “Rolling Stones” socks, $16, happysocks·com. Jewelry, Swae Lee’s own. ON SWAE LEE: Thom Browne “Wide Stripe Cuffed” shorts, $990,and jacket, $2,400, thombrowne.com. Jewelry, Swae Lee’s own. 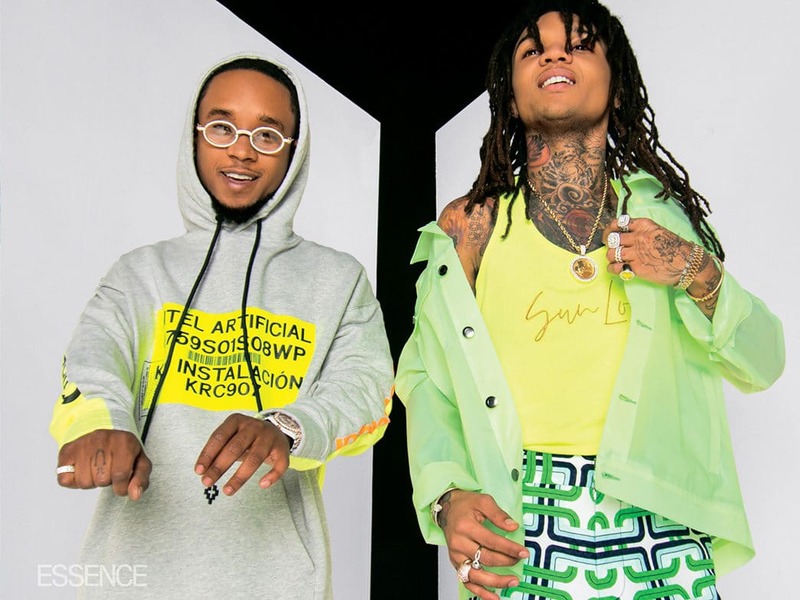 ON SLIM JXMMI: Pyer Moss jacket, $575, and jeans, $375, pyermoss.com Jewelry and glasses, Slim Jxmmi’s own. The pair also just scored a major deal with Sprite for a new beverage called Sprite Lymonade (Sprite with a splash of lemonade). And last year, the duo collaborated with Sprite on the Get Vocal campaign to raise voting awareness, especially among young people. Sprite Lymonade’s first television commercial, starring the brothers, will debut this month. My approach is to do what people aren’t doing. ON SLIM JXMMI: Romeo Hunte “Reversed Fur Mesh Sleeve Trench” coat, $3,000, romeohunte.com. Mr. Turk “Hayward Trouser” pants, $198, mrturk.com. Jewelry and glasses, Slim Jxmmi’s own. 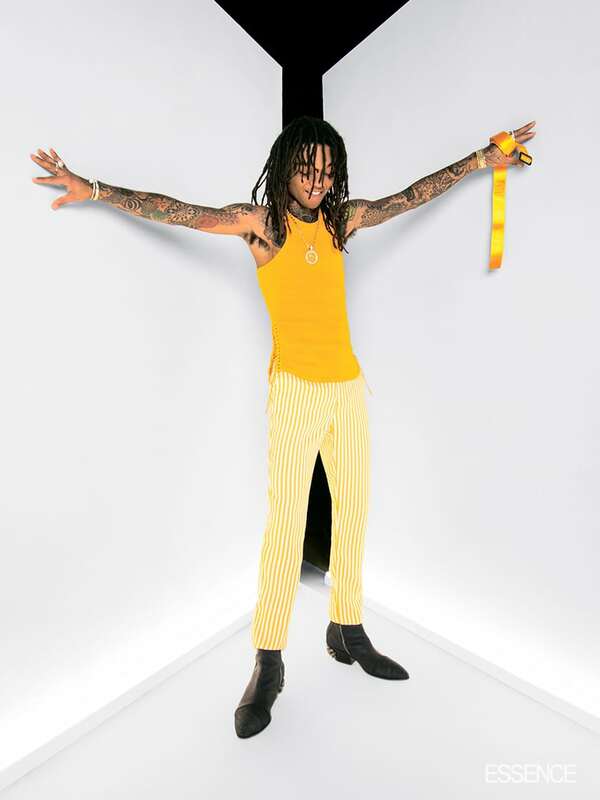 ON SWAE LEE: Mr. Turk “Arlo” jumpsuit, $298, mrturk.com. Moose Knuckles socks, mooseknucklescanada.com. Versace “Men’s Chain Reaction Tribute” sneakers, $995, neimanmarcus·com. Jewelry, Swae Lee’s own. ON SWAE LEE: H&M Studio “Vest” top, $34.99, hm·com. Scotch & Soda “Tailored Wide Leg” pants, $148, scotch-soda·com. ALIFE “Alife Logo Jacquard” belt, $45, alifenewyork.com. Jewelry, Swae Lee’s own. ON SLIM JXMMI: Marcello Burlon County of Milan “Contaminacion Over Hoodie” sweatshirt, $740, saks·com. Jewelry and glasses, Slim Jxmmi’s own. ON SWAE LEE: ASOS jacket, asos·com. Paradised “Sun Lover Tank” top, $75, paradised.com Mr. Turk “Clyde” pants, $288, mrturk.com. Jewelry, Swae Lee’s own.